Discussion in 'Audio Hardware' started by MilesSmiles, Jul 29, 2013. I have been looking for this table for a secondary system (kinda a man-cave spot) for over a year. I finally found a 1 owner table locally - just back from the audio-shop for a complete once-over (cleaning/adjustment) and proper install/alignment of a Shure V 15 Type III I have had waiting for a new home (only 30 hours on the cart). thxphotog, Day_Tripper2019, Soundnz and 36 others like this. What are the two components and other TT? WHERE OH WHERE can I get some orange vinyl? Not in pic - Pioneer S-710 L/R mirror speaker set - flawless condition used 6 months since new....long story! I'm really fortunate! This system came together with some patience but the components were worth the wait. And the orange vinyl I actually use as TT platter covers...keeps off dust, etc. They sell for $30 plus depending on what they are made of. This coloured vinyl was $3 each and I buy it from one of our local record shops - he keeps most of the coloured vinyl that comes in behind the counter for anyone who is looking for coloured lp's for artsy uses or practical uses like mine. thxphotog, Fruff76, gakerty and 77 others like this. I keep thinking of replacing it but once I cleaned out the bearing well the table seems quiet to me, I just can't find a reason to replace it. I love all the torque the motor has when using a cleaning brush. 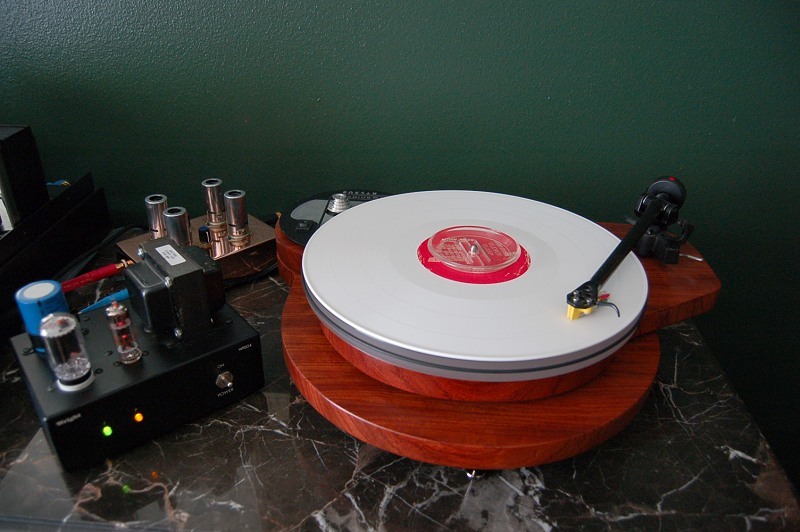 I will buy a new turntable in the near future, but I don't need one, I just want one. I also like the fact that it has auto lift and off for when I get summoned to the Queen. shutdown66, rockindownthehighway, Westerwick and 24 others like this. I should also had that I like this table more than my Yamaha P550 that was more money. gakerty, Bob_in_OKC, Tim Müller and 9 others like this. I wanted to comment on heman's table from part 3 of the thread. What color stain is that on the pilnth? I've been looking for a color like that to redo my Slingerland Gene Krupa Drumset. Oh, Here my 1952 RCA RP-190, restored with a Pickering 400 cart. Safe for all 45rpms. Westerwick, gakerty, Bob_in_OKC and 31 others like this. Westerwick, Fruff76, gakerty and 32 others like this. This is my custom table based on a Roksan Radius 5. I replaced the stock maple veneered MDF plinth with 1" bubinga. The arm and cart are Rega. The phono stage is George Wright. Westerwick, Soundnz, David M. and 40 others like this. Very, very cool Wardsweb ----AS USUAL! cporcp and gwynne61 like this. Thanks, I really do love this hobby on many levels, but the bottom line is always the music. Your artwork on the wall? That TT base is very nice. Micke Lindahl and Rickchick like this. My Rek O Kut K33 H with a modern base and much quieter motor. Westerwick, Soundnz, David M. and 37 others like this. And what, pray tell, is on the racks above those beautiful TTs? thanks, hopefully I will be able to try EMT cartridge in the kuzma/garrard compo this year. What motor did you use? It is the same motor used in Well-Tempered turntables. The whole base is a Well Tempered base. I really don't know the brand of the motor. But it is just a typical little one.